Ola, India’s largest app-based taxi aggregator, has gone global, partnering with China’s Didi Kuaidi, US-based Lyft and southeast Asian GrabTaxi to offer seamless access to cabs on their apps in these countries. The move is part of an alliance put together by Softbank and Alibaba, common investors in these firms, to take on Uber, their biggest rival globally. The single integrated app across the four companies will start rolling by March. The deal will allow the partners to leverage each other’s technology, local market knowledge and business resources, allowing customers travelling abroad to hail rides through their own apps instead of installing individual apps while travelling. The Alibaba-Softbank alliance firms have drawn investments of $7.29 billion, and are valued at $25.1 bn. Uber pioneered the asset-light taxi-hailing app concept. It has drawn investments of $8.21 bn since its inception, but its value is double that of the combined value of the alliance at $51 bn. SoftBank, which counts Ola as one of its largest portfolio companies in India, has also invested in GrabTaxi and Didi Kuaidi, while Chinese e-commerce giant Alibaba has invested in Didi Kuaidi and Lyft. Formation of the anti-Uber alliance became more obvious when Didi Kuaidi participated in Ola’s latest $500-million funding round in November. The push could potentially help Lyft, a laggard in the US, attract foreign travellers to leverage on its partners’ success in their home countries. “We are excited to partner with Lyft, Didi Kuaidi and GrabTaxi, allowing seamless mobility access across hundreds of cities globally for our combined user base that runs into hundreds of millions,” said Bhavish Aggarwal, co-founder and chief executive of Ola. There has been consolidation in the app-based taxi aggregator space at a local level across the world. Didi Dache and Kuaidi Dache, the two largest players in the Chinese market, joined forces back in February to create an entity worth $6 bn. 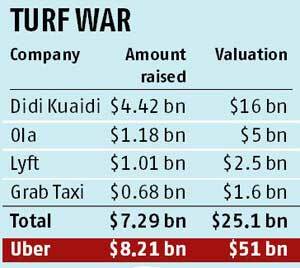 Today, Didi Kuaidi is valued at $16 bn. In India, Ola acquired rival TaxiForSure in March for $200 mn as it looked at the ways to scale quickly and fend off attacks from Uber. “They are welcome. Let’s see what then can do together what they could not do alone. I would say, bring it on,” said Amit Jain, head of India for Uber. Uber, a late entrant in India, has 250,000 drivers on its platform and has committed $1 bn to expand its operations in the country. 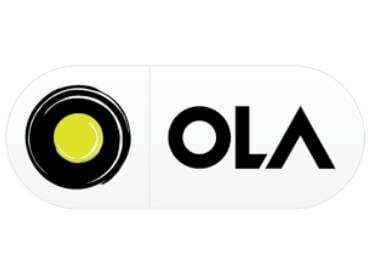 It claims a market share of 40 per cent, while Ola claims share of 80 per cent. Didi, the biggest player in China, owns 83 per cent of the market.